John Marshall was born on the 24th day of September in the year 1755, at Germantown, a roadside village in what was then the frontier county of Fauquier in the colony of Virginia; the place is now known as Midland, a station on the Virginia Midland Railroad. Attaining his majority in 1776, he entered active life at an eventful period. Colonel Thomas Marshall, his father, was born in the county of Westmoreland in Virginia, in what is still known as the Northern Neck, a peninsula thus named by reason of its location between those bold and beautiful rivers, the Potomac and the Rappahannock. Of this country the late Governor Barbour of Virginia was wont to say : “It is the prolific soil that grows presidents,” in allusion to the fact that when these words were uttered Westmoreland had contributed to the national service Washington, Madison, and Monroe, three out of the five persons who up to that time had held that rank. What Boston was to Massachusetts, Westmoreland was to the other counties of Virginia; the birthplace and the home of the Washingtons, the Lees, the Masons, the Taliaferros, the Marshalls, the Madisons, the Monroes, the Graysons, the Roanes, the Beverlys, the Bankheads, the Balls, the McCartys, the Blands, and the Carters, it became a sentinel on the watchtower of liberty, the herald to announce the approach of danger. It was here that the friends of freedom first perceived the danger-signal, as early as 1765, the date of the first Stamp Act. The Marshall family were of British descent, having emigrated from Wales to the colonies. They were distinguished by their intellect and force of character. 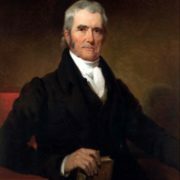 The grandfather of the chief justice was John Marshall, who left four sons, the most distinguished of whom was Thomas, father of the great judge, whose talents and character gave him a high rank in the colony. He was born in 1732, the year of Washington’s birth, and was sent to school at the academy of Archibald Campbell, a Scotchman, descended from a branch of the family of the Duke of Argyle, a clergyman of the Episcopal Church, and a thorough scholar. Thomas Marshall became a land surveyor, and accompanied Washington, who was his neighbor and had been his schoolmate, in his surveying expeditions for Lord Fairfax. He was afterward a lieutenant of Virginia troops in the French war, and was present at the defeat of Braddock. He was several times elected to the Virginia House of Burgesses, never failing to obtain the suffrages of the people, whose respect and confidence he held in the fullest measure; and he warmly participated in all the earliest movements to encourage the colonists in resistance to British tyranny. When the call to arms was made in Virginia, he was one of the first to offer his services, and was a field officer of the first regiment raised. In his first engagement, at the battle of the Great Bridge in 1775 with a detachment of British troops under Lord Dunmore, he was distinguished for valor and good conduct. Afterwards he successively commanded in the Continental line the Third Virginia Infantry and the First Virginia Artillery, as their colonel, serving most of the time with Woodford’s brigade. He was in the battles of Germantown and Brandywine, having three horses killed under him, and in the latter engagement contributed largely by his courage and skill to save the American army. He endured, with three of his sons, all the hardships of the winter campaign at Valley Forge. Subsequently he was ordered to join the southern army, and with a part of his regiment he was taken prisoner at Charleston. During the term of his parole he made his first visit to Kentucky through the wilderness, in 1780. Returning to Virginia, he remained to the close of the war, and in 1785 emigrated with the younger members of his family to Kentucky, near Versailles, in Woodford County, which he procured to be named Woodford, after his old friend and commander. In the early history of Kentucky he bore a scarce less active, distinguished, and patriotic part than he had done in his native State. He died in 1806, at the home of his son, Captain Thomas Marshall, in Mason County, and lies buried in the family cemetery near Washington, in that State. In token of his great bravery and patriotic services, Colonel Marshall was presented by Edmund Randolph, attorney-general in Washington’s cabinet, and also governor of Virginia, with a splendid sword, now in possession of one of his descendants in Kentucky, and preserved as a precious heirloom in the family. Of the mother of the chief justice we know but little more than that she bore fifteen children, seven sons and eight daughters, and that she reared them all to mature years. She could have had little opportunity to make any other record for herself, and could hardly have made a better one. Of the fifteen, John Marshall was the first born. The date of the removal of Colonel Thomas Marshall from Westmoreland to Fauquier is not certainly known. It must have been soon after his marriage, for his son John was born, as we have seen, at Germantown in Fauquier, in 1755. Subsequently he acquired, and moved to, the fine estate of Oak Hill, in another part of the same county, which continued to be the seat of the Marshall family up to a recent date. Colonel Marshall was a gentleman of intelligence and plain education, and devoted himself personally to the training of his children. He had a private teacher from Scotland, a Mr. James Thompson, a clergyman, who came to this country and took up his residence in the family of Colonel Marshall in 1767, and instructed his sons, John and James, and others. John Marshall early evinced a strong love for English literature, especially in the departments of poetry and history. At the early age of twelve it is said that he knew by heart a large portion of Pope’s writings, and had made himself familiar with Dryden, Shakespeare, and Milton. Subsequently, at the age of fourteen, he was sent to school in Westmoreland County, to the classical academy of the Messrs. Campbell, in which formerly his father and General Washington had been pupils, and where James Monroe was one of his fellow students. Returning home at the end of his term, he continued his study of Latin, reading Horace and Livy. He pursued these studies under the direction of his old preceptor, Mr. Thompson, who was an accomplished classicist. Fortunately he was also fond of athletic sports and exercises in the open air. He began the study of law at the age of eighteen; but the impending struggle with Great Britain so absorbed his mind as to interrupt his studies before he had obtained a license to practice. He joined a company of volunteers, and by precept and example stimulated the spirit of resistance to British oppression. See Bishop Meade’s Old Families of Virginia, vol. ii. p. 434, Appendix. [Joseph Story,] Discourse on the Life of Marshall, p. 9.